I am totally fascinated by this stuff. And fortunately so are my little friends. 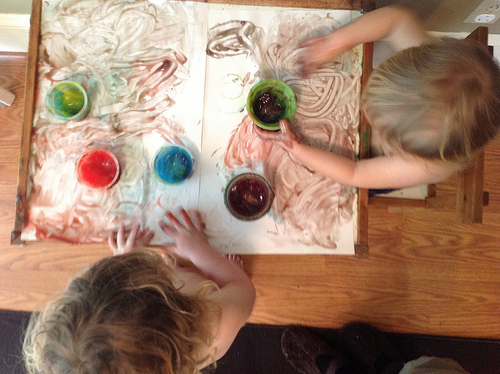 We keep making new batches of home made finger paint every few weeks. Mix together cornstarch and water in a saucepan until there’s no lumps. Mix together gelatin and water and set aside. Cook cornstarch mixture over medium heat, stirring constantly, until it boils. It’ll become thick as you’re stirring. Remove from heat and stir in the gelatin mixture. Cool and pour into smaller containers. Add food coloring for desired colors. 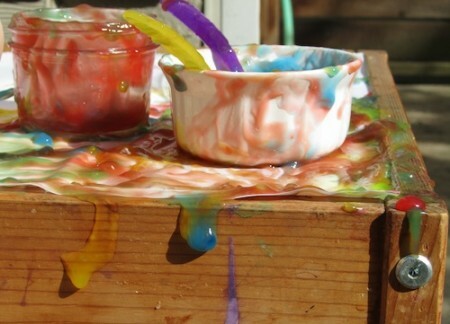 It’s the most amazing, drippy, bright gooey stuff. It drips off the edge of the table and glistens in the sun. Yumm! Fun to rub, scratch, plop, smear all over the page and if need be your belly too. 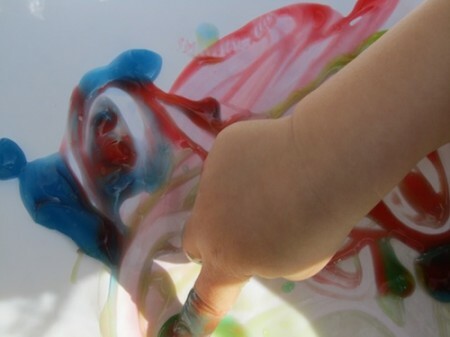 Hop over to flickr for more of our finger paint adventures.